Are Reverse Mortgages EVER Okay? Reverse mortgages should only be used as a last resort. You know the old saying, “If it seems to good to be true, then it probably is.” Well, it seems that saying could easily apply to the reverse mortgage industry. Because of that, if you are considering one, you need to proceed with extreme caution. Being able to borrow against the value of your home can seem like a really good idea at the time, but when it comes time to repay the loan (because that’s what this is after all), it can create real problems for your heirs or even yourself if you end up having to move out of your house unexpectedly. you own your home free and clear or have a low mortgage balance. if you need extra money for medical costs or other bills. if you want to use the proceeds to downsize to a smaller home. your home lost a lot of equity in the housing downturn. the mortgage lender pressures you and also asks you to buy annuities or expensive financial services. you plan to move in a few years. you want to leave the home as an inheritance. Bottom line from Dave: In most cases reverse mortgages should only be used as a last resort! The costs of these loans make them a very expensive way to get funds. A home equity line of credit should be considered before a reverse mortgage. And you should definitely get advice from an experienced elder law attorney before doing so. It’s possible that other benefits such as VA or Medicaid could be a better option for care than a reverse mortgage. Give us a call at 217-726-9200 if you have questions about this topic. http://edwardsgroupllc.com/wp-content/uploads/2010/03/estate_image_v3.jpg 500 646 edwardsadmin http://edwardsgroupllc.com/wp-content/uploads/2014/02/USE-Logo-estate-planning-280x100.png edwardsadmin2015-01-08 14:38:532018-08-20 16:50:03Are Reverse Mortgages EVER Okay? We tend to do things a little differently around here. After years of doing planning the traditional way (and seeing ways that the process could be improved), I started my own firm. Not only is it important for me to educate you about planning financially, I also want you to think about the non-money planning issues that are often overlooked by more traditional estate planning. Not planning for non-financial issues can be just as tragic as not planning for more traditional money issues. This lack of planning can lead to poor quality of life for you, extra stress for your kids and loss of a legacy. 1. Healthcare. Who will make your healthcare decisions if you can’t? And will they know when to “pull the plug”? When they do pull the plug, will your organs be donated? Solution: You need to cover the proper legal authority through a healthcare power of attorney and a living will. Also, have conversations with your family about your wishes so they know, without a doubt, how you want them to act on your behalf. 3. Wisdom. What does your family stand for? What values were important to your parents and grandparents? Will your grandkids know about those? Solution: Take the time to reflect on these things and write them down. You can find resources for where to start online, or even hire someone to help you at the Association of Personal Historians. 4. Online or computer stuff. More and more of our lives are being lived online – Facebook, online photos, emails with your grandkids. How will your family access that info after you’re gone? In this day and age it’s important to have a plan for this. (Read a real life story about it here.) Solution: You can store the information yourself in a safe deposit box, you can use one of the newly formed companies out there (SecureSafe or PasswordBox), or your attorney can keep the information for you. 5. Family heirlooms. Grandma’s old table, the shotgun with the homemade stock, the family Bible that’s over 100 years old. What will you pass on? And will you pass along the story that goes with it? Antique shops are filled with stuff that has some value to a stranger, but could have been priceless to family members, if only the story behind the item had been preserved. Solution: Take the time to clearly communicate your wishes or preserve the stories behind those special items. You can include the history of family items as part of your “special stuff list” or in a separate letter your family will get after you’re gone. 6. Guardians for kids. If people who don’t share your values end up raising your minor children, then the money you leave won’t really matter. Solution: We help clients make this tough choice through resources like our Child Raising Priorities Checklist. 7. Sibling relationships. If you become disabled and one child is the primary caregiver, will the rest of the family be prepared? Will the caregiver feel like no one else is helping out? Will the other siblings feel like the caregiver is overspending your money? Only you can know the answers to these questions. Solution: As part of our process we will discuss with you how to best choose helpers and how to make sure they know what to do when the time comes. Good planning helps avoid misunderstandings between siblings. 8. Burial wishes. Do you want to be cremated or have a visitation? What will your obituary say? Will you plan it out or leave it to your kids to decide (or fight about) during a time of grief and high stress? Creating a funeral plan or burial plan can be a real gift to your family and make the time of remembering you more meaningful. Solution: In Illinois, you can specify your wishes in your Disposition of Remains document, which provides binding burial instructions. 9. Living arrangements. If you’re near the end of your life, sick and unable to care for yourself, all the money in the world won’t matter if your living arrangements are not what you want for yourself. How important is it that you remain living on your own? Are there certain facilities you absolutely do not want to be placed in? Solution: As part of your disability instructions in your living trust, you can be very specific about how you want to be cared for and where you want to live. 10. End of life issues. Do you want to be kept alive with a feeding tube? Ventilator? Will your family know what your wishes are? If you are 85 years old with terminal cancer, would you want heart surgery just to prolong your life a few weeks or months? Solution: Your living will and healthcare power of attorney give the legal authority and instructions on those issues. But it is also very important to discuss these difficult issues with your family so they understand your preferences. See our Infographic illustrating these issues HERE. We are always happy to talk with you about any questions or concerns you might have. Just give us a call at 217-726-9200. And if you want to learn more about the process of planning, feel free to check out a free workshop. Our workshops are a great way to learn about our unique process. Just recently, here at Edwards Group, we had this sort of situation arise as well. A client had an old 401(k) from a previous job in which his parents were named as beneficiaries. Unfortunately, they had passed away so the 401(k) had no beneficiaries listed. When the client died, we had to go through the expensive process of probate court to get the 401(k) into the hands of the right people. Improper beneficiary designations can also jeopardize nursing home care if Medicaid is paying for that care. Recently we had a case where the spouse of someone in nursing care died, leaving money to the disabled spouse instead of their adult children. This large amount of money is now jeopardizing the surviving spouse’s benefits. 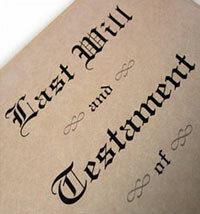 So, what types of assets with beneficiary designations trump a Will? Make a list of all retirement accounts, life insurance policies, annuities and investment accounts. To the right of those specific assets, write who the beneficiary is and the date you last designated them. Review this list once a year (like on April 15). Or join the Dynasty program where we help you keep up with all of this. We’ve also included a PDF you can download to help make the process easier. This whole issue highlights why Laura and Liis are so important to the clients at Edwards Group. Many of you may wonder why we need two Asset Coordinators, but it is a big job and it is a critically important job. One of the biggest mistakes people (and even other attorneys) make is not properly handling assets within an estate plan. You cannot have an effective plan if the assets have not been properly titled, designated and coordinated. As always, if you have any questions about beneficiary designations or any other estate planning or elder law issues, please call us at 217-726-9200. We will be happy to speak with you and answer any questions we can. Creating a “special stuff list” will go a long way in keeping the peace once you’re gone. Sadly, in my line of work, I see families fighting much more often than I would like. And while the media might lead you to believe it’s all about the money, oftentimes the fights are about things like Grandma’s curio cabinet full of keepsakes. When it comes to preventing a big fight after you die, a will just isn’t enough. Even with an effective will, there is plenty of room for disagreement and fighting. Because of this, I encourage clients to create a “special stuff list” that directs certain items to the people they want those items to go to. This list, which is officially called a Memorandum for Distribution of Personal Property, is then incorporated into the Will or Living Trust. 1. What did your parents or grandparents pass down to you that you want to pass on? 2. What items bring back the most memories of your family time? 3. Have you discussed with family what items they might want? 4. How will you preserve the stories behind the items? Write out the story and record a video or audio about it. Even a few short sentences will mean a lot. 6. Create a special stuff list and make sure it is signed, dated, and copies sent to your attorney and also kept with your Will or Living Trust. We’ve created a great resource to help you create your “special stuff” list. Download the worksheet by clicking on the button below. A good resource on the matter is Who Gets Grandma’s Pie Plate, a resource developed by University of Minnesota professor, Marlene Stum. On her website, Stum shares tips and stories from families who have faced this difficult topic. This article, from Consumer Reports, also has some good tips. Sadly, loved ones left behind bear the burden of lack of planning. So, what happens when you die without an effective plan or even a will? In the US courts, if someone dies without a will it is called intestate, which basically means the state will decide what to do with any assets. There will be a lot of paperwork, court appearances, etc. One of the most difficult things is making a list of all assets and debts. Since these types of things are not typically discussed freely, this can be a real headache for your loved ones left behind. During a time of grief they have to play detective trying to hunt down what you may own or owe. We know there are a lot of reasons people don’t plan. Tarina says a lot people admit (after planning) that they were really intimidated by the process or didn’t feel they knew Attorney David Edwards well enough, but none of them regret finally taking the leap and planning. At Edwards Group we’ve worked really hard to make the process as painless and effective as possible. We also offer a money-back guarantee. Now, what attorney do you know of who does that? 1) Our free, no pressure workshops are a great way to learn more about the planning needs your family may have at every stage of life. It’s also a great way to get to know our firm better. 2) If, after attending a workshop, you would like to take the next step, call 217-726-9200 to schedule an Initial Meeting. You can read more about that process here. 3) Not ready to talk to a person yet? We have put a lot of our time into developing a website that contains helpful information about all aspects of planning. You’ll find hundreds of articles about estate planning, trusts, Veterans benefits, Medicaid and Medicare on our website. Feel free to use the search button to quickly get to what you need. No matter what, I hope that you will take the time to learn about ways to protect your family and your assets. The other side of our practice involves helping people who didn’t plan properly clean up the mess that’s left behind. My sincere desire would be for every family to have effective planning strategies in place and for no family to have go through the consequences of bad planning. Take a step in the right direction today by attending a workshop, giving us a call at 217-726-9200, or signing up for our weekly email newsletter. What’s Your Next Step in Planning? Bailey has noticed that I talk to other cars a lot when I’m driving. When someone’s being slow I might say, “Come on out there, buddy, pull right out there.” Or “come on, you can do it,” when they hesitate just a little too long before pulling out so I can go. As with just about everything in life, this reminds me of planning. No matter how much I talk to the other drivers in those cars, it doesn’t really do a whole lot of good. And that’s just like planning. Talking about planning doesn’t actually do any good, unless you do something about it. Whether that’s nursing home planning, estate planning, death planning, life care planning or special needs planning, talking about it or even coming to workshops and learning more doesn’t do any good unless you move ahead. So what’s your next step in planning? 1. Attend a workshop – If you already know a little bit about planning, and want to know what it would be like to work with Edwards Group, we encourage you to check out a workshop. In addition to getting valuable information about the process, you’ll get to meet David and have the opportunity to ask him questions. Our current workshop is Aging With Confidence: 9 Keys to Wise Planning & Peace of Mind. 2. Call to schedule your Initial Meeting – At your initial meeting, which usually lasts about 45 minutes, we will review your concerns and goals. An attorney will also help you understand the unique risks facing your family. Clients find this meeting to be very valuable in helping them understand their options. By the end of the meeting, you should understand your planning options, what they will cost and whether Edwards Group is the right firm for you. There will be no hard sale. We want all of our clients to feel comfortable before starting to work with us. It’s one of the keys to drafting a successful plan. Did you know that Tarina was a client before she started working at Edwards Group? And one of her favorite parts of the job is talking to people who have questions or might be a little nervous about starting the process of planning. If you have any questions at all, she’d be happy to chat with you. Just give her a call at 217-726-9200. 3. Help your friends and family learn more – If you’ve already worked with us and had a positive experience, we encourage you to share all you’ve learned along the way with friends and loved ones who might need to know what you now know. The most important part of creating an effective plan and achieving peace of mind is actually taking a step forward. Many people think about planning for years… and then all of a sudden it can be too late. Effective planning is much easier achieved before a crisis hits. Which next action step do you need to take today? http://edwardsgroupllc.com/wp-content/uploads/2014/02/USE-Logo-estate-planning-280x100.png 0 0 edwardsadmin http://edwardsgroupllc.com/wp-content/uploads/2014/02/USE-Logo-estate-planning-280x100.png edwardsadmin2014-02-17 15:43:402018-09-07 19:48:57What's Your Next Step in Planning? Because of the popularity of this post, we created a handout to go with it. Download the handout now. Navigating the challenges of in-home care can be a little easier with an experienced guide by your side. 1. Set up caregiver agreements and in-home caregivers. There are a lot of pitfalls to watch out for with in-home care. As elder law attorneys, we are familiar with all these pitfalls and help people plan for, and avoid, these pitfalls everyday. One of the best ways to do this is through the use of a caregiver agreement. 2. Analyze how long your funds will last. Because elder law attorneys do this sort of thing all the time, we are very familiar with what aging costs, the resources available to fund it, and how best to use the tools available to get good care for as long as possible. 3. Set up trusts for protection. Years ago trusts were only thought of for the very rich, but that is no longer the case. These days, trusts are one of the most powerful tools in our legal toolbox. They can be used to help qualify for VA or Medicaid benefits, which translates to more resources to pay for care for you or your loved ones. 4. Draft powers of attorney or revocable living trusts. These powerful and necessary documents help guide decisions during a disability – that time when we need to take away your checkbook because of a stroke or dementia. These legal tools help preserve dignity and quality of life. They also help you to stay in control as long as possible. 5. Help you qualify for VA benefits. VA planning can be complicated, but qualifying for benefits can really make it worthwhile. Many people don’t realize they are eligible for in-home benefits through the VA, or how to prepare legally and financially to get the maximum benefit as soon as possible. We help families every month to qualify for VA benefits. We know the ins and outs of getting you qualified for the benefits you earned in service to your country. Learn more about that here. 6. Give feedback on care options. Like I’ve said before, many people go to friends for advice on these issues, but chances are your friends have only dealt with these issues once or twice. We work in this field everyday which means we are very familiar with, not only legal issues surrounding in-home care, but other issues like which facilities and companies are the best to work with — and we’d love to be your resource in situations like this. 7. Plan for potential nursing home costs. While everyone wants to stay in their own home as long as possible, the reality these days is that most people will spend some time in a nursing facility. Planning ahead now can help you be prepared for later. Suddenly being surprised by the need for Medicaid is not the kind of surprise you want. Sometimes good planning for long term care requires rearranging your finances. With IRAs and annuities, those changes could result in income tax. Working with your accountant, we help you understand the tax impact of long term care planning options. 9. Preserve your wishes upon death. Sometimes, as we age, our current reality can jeopardize any plans we might have for the future. Consulting with an experienced estate planning and elder law attorney can help maximize benefits now, providing good care during life, without jeopardizing your wishes for the future after you are gone. There is a lot to keep in mind when considering home healthcare, but we help guide people in these decisions everyday, weighing the pros and cons. Our Elder Care Advisors help families everyday to navigate this stressful time of life. If you need to speak to someone right away about your current situation, we would be more than happy to talk with you at 217-726-9200.